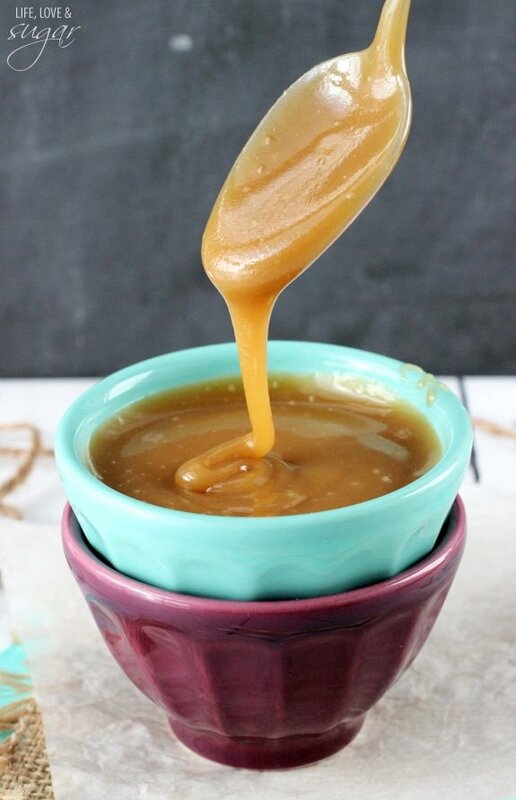 This Caramel Sauce is a very easy one to make – and it’s my favorite! 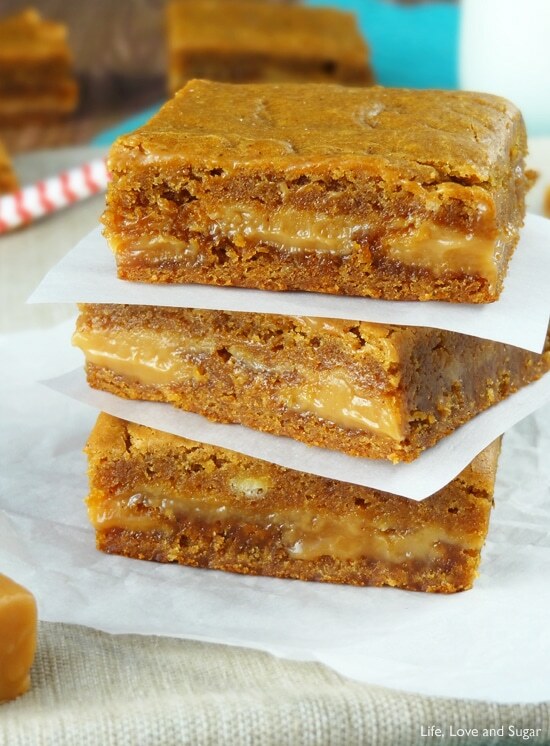 I love the flavor that you get from a caramel made with brown sugar! And this version is harder to burn and ruin – a definite plus! Fall is quickly approaching and I’ve been enjoying some seriously nice weather recently. We have a little outdoor area at the building where I work. I can sit in the shade and work and the last few days have been beautiful – almost chilly. It’s totally getting me in the mood for fall and all the flavors that fall brings – especially apple! And caramel is the perfect pair for apple, don’t you agree? 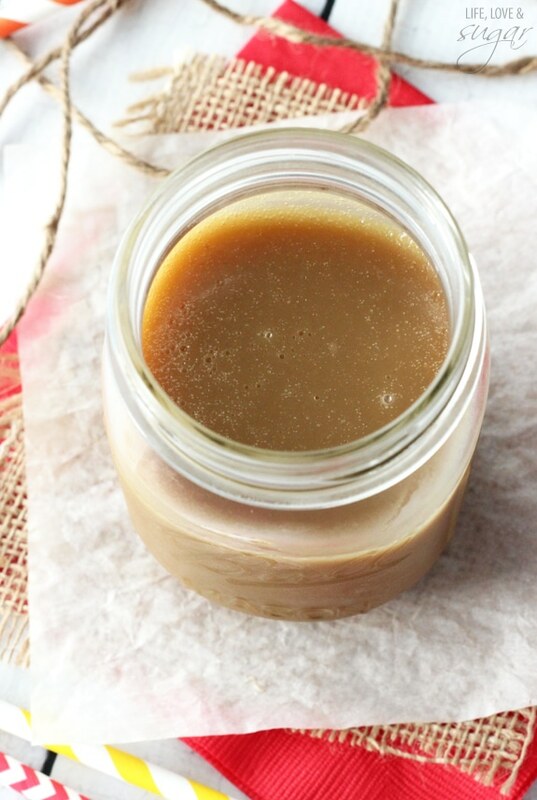 You can totally expect to see this caramel sauce coming up in a few upcoming posts. I’m pumped. Caramel is absolutely one of those things I can’t get enough of. You basically melt everything, bring it to a boil, then let it cool. Easy, right? One of the things I like to know about my caramel sauce is what the consistency is like at different temperatures. When warm, this sauce is thinner, but still thick enough to be perfect for drizzling on ice cream and other desserts. At room temperature, it’s thick, but not hard. If you grab a spoonful, it won’t drip everywhere. It stays right on the spoon. And of course, when it’s cold, it’s very firm. Like, hard to even get a spoon into it firm. And the longer you let your caramel boil, the thicker the sauce will end up being. I recommend the 3 minute mark, as noted in the recipe. So this weekend is a three day weekend – gotta love those! We’ll be celebrating Labor Day with the family in town. West Virginia University is playing Alabama in their first football game of the season on Saturday and we will be going with my parents and some other family and friends. My dad played football for WVU, so any time they play nearby, he makes sure he’s there. We’ve got all kinds of WVU paraphernalia ready to go and I’ve been tasked with making some festive treats, so I’ll be getting on that tonight. What are you doing for the holiday? I hope you have something fun planned! 4. Remove from heat and allow to cool. Store in refrigerator. Recipe slightly modified from Pioneer Woman. 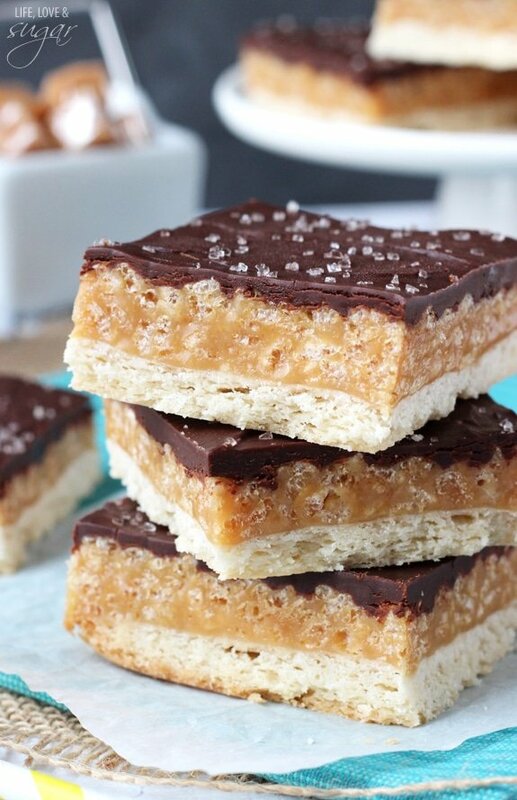 I’m super excited by this recipe because caramel is kind of my nemesis. I manage to mess it up all the time! But this seems kind of foolproof, so I can’t wait to give it a shot! It is easy. Had another recipe with about 3 more ingredients, but this was easy and very good. I’m making a turtle trifle for a neighborhood ladies Christmas get together and didn’t want to use a jarred caramel sauce. This will make it tastier. Loved your scripture for the week. You’re right Lindsay this is easy. I subbed dark brown sugar for the light and it tasted awesome. Also I had tried previously making it with granulated sugar and half and half and it turned out a thin water like consistency-even after resting at room temp and refrigeration. Thanks for the great recipe.???????????????????????????????? 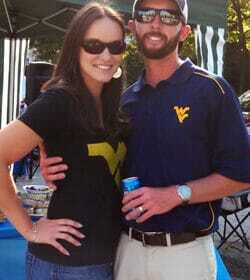 I am so looking forward to finally meeting you and tailgating with you and your family this weekend!! Can’t wait to see what yummy treat you are bringing!!! 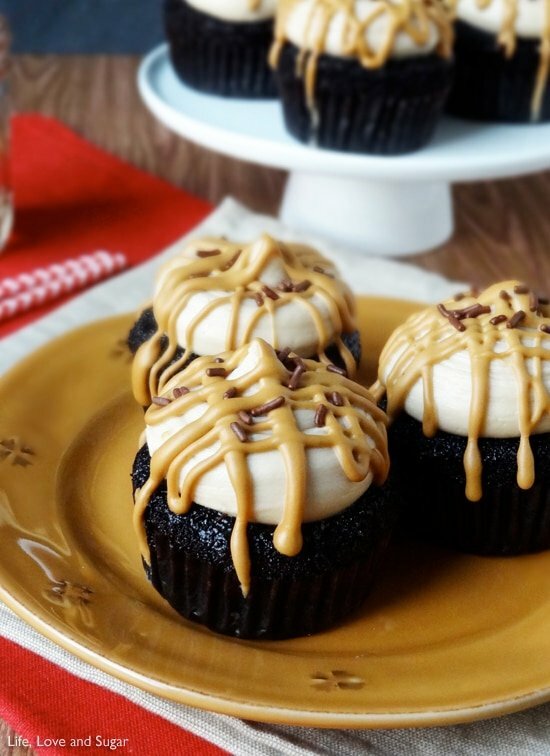 YES to homemade caramel. It is SO easy and better than store bought. I could lie and tell you I am going to smother this on an apple but, really, I am just gonna face-plant straight into it. Pinned! I couldn’t wait to dig in either, I drizzled it into my coffee-What a treat.???????????????????????????????????????????? Mention caramel and you have my full attention! Your photos are great on this post. Just made this to serve over pumpkin cobbler and vanilla ice cream! It is perfect! As I needed to eat breakfast while preparing this Thanksgiving potluck dessert, I decided to taste test the caramel sauce over my morning oatmeal. Enough said. Thank you for the simple recipe and Happy Thanksgiving! Ooooo brown sugar caramel! That sounds amazing! It is perfect for Fall and I can’t wait to see what you have in store for us with it!! 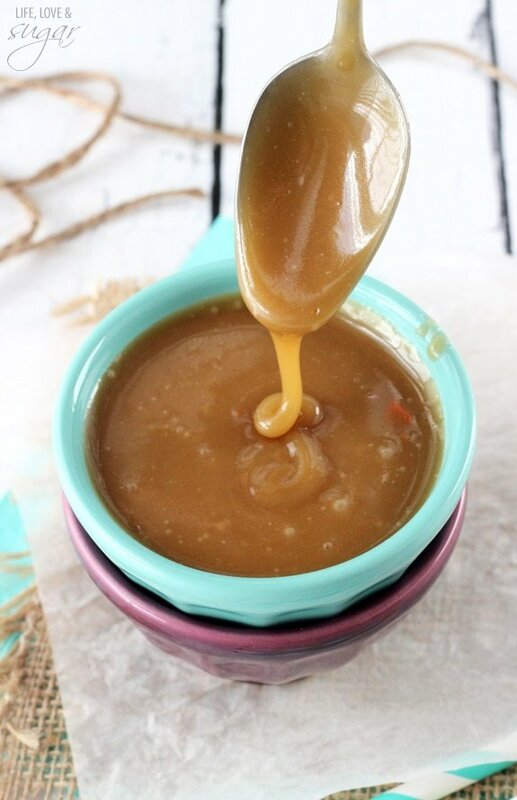 Oh my goodness, how delicious this caramel sauce looks! Looking forward to what you have planned for next week… Have a great weekend! 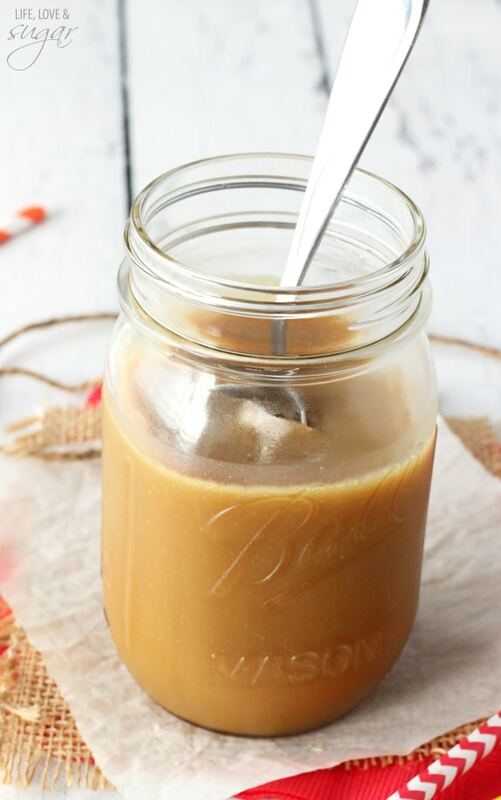 This sounds so delicious- I love caramel! I have one question. Is the stick of butter salted or unsalted? Just want to make sure it’s the right one! Thanks Heather! I use salted butter. You’re welcome Lindsay, and thank you so much! 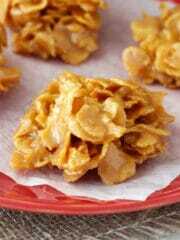 Off to make some caramel sauce and the caramel apple cookie cups! I must try them! This looks so good! I am goning to make it for sure. Do you know how long it will keep? Thanks Carol! It should keep for 2 weeks. Ha ha! “Harder to ruin” is ALWAYS a selling point with me. And that one picture with a scoop right out of the middle of the jar makes me weak. I’m definitely giving this a bash soon. Thanks! Yes, it can be made 2 days in advance. You could leave it at room temperature, but just so you know it can get a little gritty that way. Once it’s heated back up though, it’s fine. The caramel sauce used in this recipe stays smoother at room temperature, if you’d rather try that. Both would be fine, just a preference. Pingback: Fall Flavors: Caramel Apple Blondie Cheesecake | work. life. charm city concierge. Do you stir the sauce during the 3 minute boiling time? Thanks ! Yes, you’ll want to keep whisking it the whole time so it doesn’t burn. Hmm, I’ve never had that happen before and I’ve made it quite a few times. Perhaps it didn’t cook long enough? Same thing happened to me. It looked great at first. Brought it to room temp and about an hour later it started looking super gritty, so I tried reheating and all the oil just separated out. That’s strange. I don’t why it would separate. I just made it again the other day and it was fine. It can be a little gritty at room temperature. Try putting directly into the fridge to cool, then heat it up when you need it. 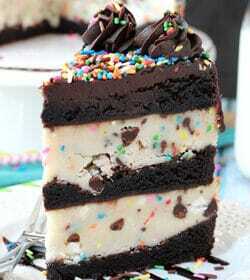 So I’m tried this recipe for the first time for my brothers birthday and everyone loved it! But when I made the caramel sauce it only made about 3/4 cups and not the 1 1/2. I don’t know what happened so next time I’ll just double the ingredients! Is there a way of substituting the heavy cream to make this dairy free? I’m not very familiar with dairy free substitutes, but it’s possible that coconut milk might work. This was absolutely fantastic!!! I made it for Xmas gifts last year. However, after awhile it began to crystallize in the fridge. Anyway to stop that from happening?? Do you know how long it was in the fridge? It’s probably best to use it within a week or so. If that happens, you could try heating it up again and stirring it to see if it comes back together. 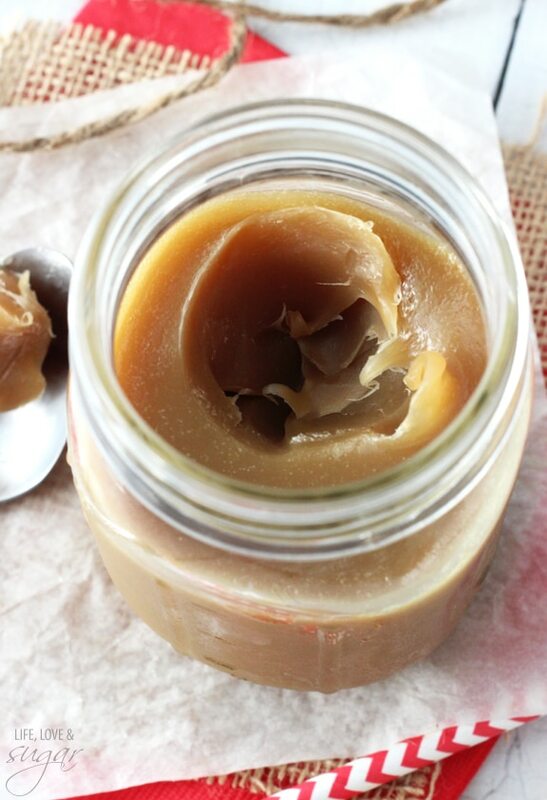 I made the Easy Caramel Sauce and it has cooled in the refrigerator. Mine is sugary. Did I cook it to long? If I warm it will it get smoother? Thank you It’s delicious! I wouldn’t think it’d be because it cooked too long. It could be because it heated up too quickly, without having a chance to melt all the sugar. Maybe try a lower heat setting next time. Hi i have a question, since english is not my mother language.. When you write “Bring to a boil and boil about 3 min”, does it means i put all the above ingredients in to a boil water and mix for 3 min, or do you mean i put the sauce pan in top of/inside a boiler? There is no water used. The ingredients in the sauce will all come to a boil in their pan. Does that help? I am a first time caramel maker. lol I made this recipe today of yours and the taste is amazing. the only problem is now that it has cooled it has seemed to crystalized and is not a thicky creamy liquid like yours looks in the pictures. When it was cooling is also seemed greasy and is still the same way. Do you use a specific butter? I used butter kirkland brand from Costco. Do you think I didnt bring it to a high enough boil? I did boil it for the 3 minutes. Im just trying to figure out what i am doing wrong. I am going to put this in mason jars with apples as a gift for the teachers for halloween. Any help you could recommend would be so appreciated. Hmm, that’s strange. I’m not sure, I’ve used Costco brand butter before and it’s been fine. It’s so hard to say without being able to see it. I’m sorry. What are the instructions to use on making Caramel Apples? Would you make the sauce when you want to make the apple or make ahead and reheat. If it is the make ahead option, reheat on the stovetop or microwave? 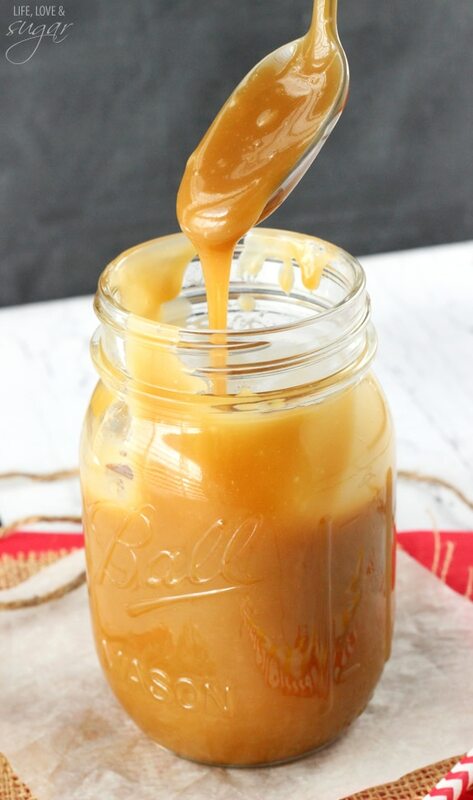 This caramel sauce isn’t thick enough for caramel apples and I don’t have one on my site that is. I’m sorry. 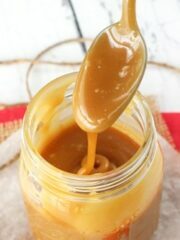 Hi – although this caramel sauce was extremely easy to make, the end result came out badly for me. As it sat to come to room temp, it separated. I have no idea what when wrong as I followed the instructions exactly as they were given. Any idea what happened. I had to throw the entire batch out which was unfortunate. 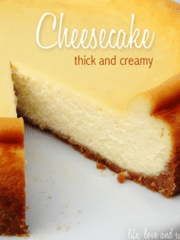 It tasted great but with the butter separating from the rest of the sauce I was afraid to use it in the cheesecake. Hmm that seems strange and I’ve never had it happen before. I did a little googling and a few common suggestions where not stirring enough while it cooks and then humidity can sometimes be a factor. If it came together well while cooking, it does seem strange that it’d separate though. I’m not sure. I made this according to instructions, it did not separate however…..this is more like penuche candy than caramel sauce. Its really great, super sweet but slightly gritty, just like penuche candy is. I loved it and will definitely make more. Oh my gosh! I just made this, this evening. We had been grocery shopping and I noticed that I had forgotten to pick up caramel for my coffee. I had an oh no moment lol… I am so glad I found this recipe, it’s super easy! Took about 15 mins to makes and tastes worlds better than store bought! I will never buy store bought caramel again! I did make one small alteration, I didn’t have heavy cream so I substituted evaporated milk and it came out amazing, I used the same measurements and directions 🙂 it came out perfect! Ok so I love this caramel sauce. But it always seems to get grainy when it cools. What am I doing wrong or what should I be doing? I believe it’s because the brown sugar isn’t fully melted. You could try turning the heat down a bit to more medium low so that it melts slowly, but all melts. OMG, this is so GOOD! I can’t believe how easy it is. I think this is actually butterscotch, and not caramel because it’s made with brown sugar and not white. Super yummy! Thanks! Technically, yes. 🙂 Glad you enjoyed it! Super easy and good. I added a pinch of sea salt at the end. I’m so glad I found your recipe!!! I lost my camel recipe when I moved. I make this all the time for carmel rolls with one difference…. I use French vanilla ice cream instead of heavy cream my oh my!!!! It makes the most scrumptious caramel!!! Its a trick a friend of mine shared when she brought carmel rolls to work and I ate almost 1/2 the pan! ???? lol. Let the cinnamon rolls do their 2nd rise in this carmel and it will change your life !???? This sauce looks delicious! I may have to try your method – I haven’t had too much luck making my own in the past.